After former company president Sean Parker said Facebook was exploiting human psychology to the detriment of its users, and ex-vice president of growth Chamath Palihapitiya implied that Facebook may be responsible for creating “tools that are ripping apart the social fabric,” Facebook says it’s instituting a new policy to help combat some of the more egregious engagement baiting that takes places on its social network. To help reduce the number of “Like this is you’re a 90s kid” or “Share this to win a free phone” posts that almost certainly plague your feed, Facebook has developed of new machine learning model that can identify these kinds of posts and then de-prioritize them so they show up less often. While Facebook’s use of machine learning is somewhat novel, this move is actually just the latest in the company’s long-running attempts to help clean up your news feed, which started way back in 2014. 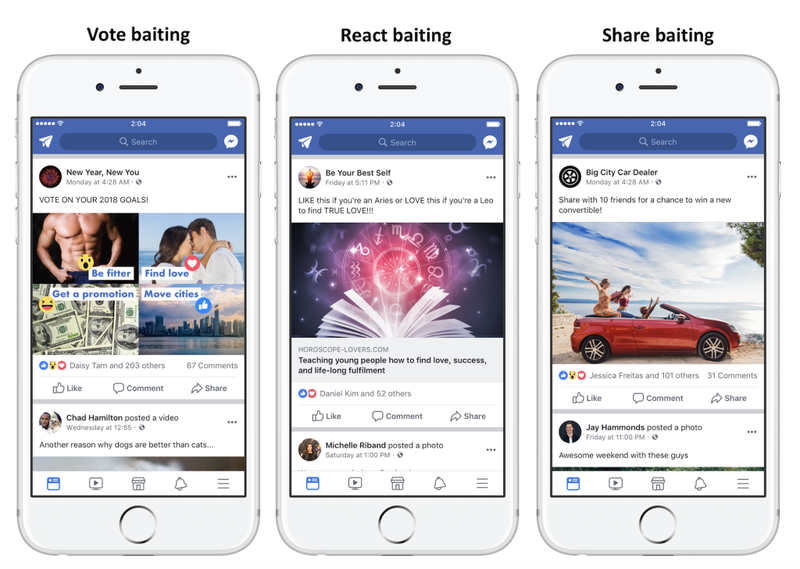 Facebook also stated that in the coming weeks the company will start demoting pages that continue to repeatedly bait engagement with these kind of posts. However, Facebook was also careful to note that it will not punish posts asking for help or trying to support beneficial causes, like raising money for charities or missing child reports.